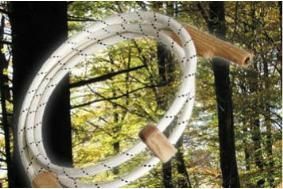 Swedish high-end company develops 'Nature Materials' cable system | What Hi-Fi? Entreq wires use gold, silver, leather, cotton, flax and wood – and a complete set-up will cost you about £27,000! The plugs and backbone of the cables are made from natural beech wood, which has been stored for more than 45 years, and plastics are replaced throughout with flax. The company says that "In the past we have made use of a proprietary RCA connector, completely free of metals other than in the signal paths and with a core of Teflon. "But as we discovered that not even Teflon is free from creep currents and static electricity, the choice fell on wood. A natural material with properties that are totally unbelievable." Per-Olof Friberg of Entreq adds "I think that these are not only the best cables ever made in Scandinavia; at the same time I am afraid that they are the most expensive! Supreme 09 is for those who are only satisfied with the very best." A complete system of Supreme 09 cables - power cable, interconnects and biamp speaker cables – uses 95 grams of 18-carat gold, 55 grams of silver, and 1.75 square metres of Swedish 'Elmo' leather. The cables are all made by hand and a set takes more than 100 hours to assemble. You can order a set from the company's website for €30,000, or about £27,000, and all the cables are supplied with a six-week 'on approval' return policy.